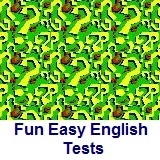 ﻿ Fun Easy English - new classroom free online classes english language lessons speaking listening writing reading february 6. Today in the Fun Easy English classroom you are going to learn about conjunctions an important part of English grammar. Examples: and, but, for, nor, or, so, yet. Examples: after, although, as, because, before, how, if, once, since, than, that, though, till, until, when, where, whether, while. Examples: both...and, either...or, neither...nor, not only...but also, so...as, whether...or. Hey this is a classic video about conjunctions. This is the way I learned about them as a kid. Watch this video and post a comment about it at the bottom of the page. Study the types of conjunctions listed above. Then fill in the blanks of each test question with the correct conjunction. 1. We had few choices, ________ we chose the least difficult one. 2. ________ he is a hard-working student, he is not getting very good grades. 3. Please call me ________ you leave so that I can give you directions. 4. They went to the store ________ bought some food. 5. John rarely goes to the library with ________ Joan ________ Jill. 6. They will not leave ________ the show is over. 7. Joan didn't come to the party ________ she had to work. 8. John asked Joan to attend the meeting ________ she was unable to go. 9. ________ she finished her homework, she went to the park. 10. ________ John ________ Joan can speak a foreign language. In this lesson Anna meets a new friend. Phil is new to Washington, D.C. and he feels lost in the city. Anna asks him to make the city a friendlier place. Anna: You know, I am from the country and sometimes I miss it. But I really like life in the city! I love the city. Oh, look. Someone lost a bag. Maybe it's theirs. Excuse me. Is this bag yours? Dr. Jill: No. It's not mine. It might be hers. Anna: Excuse me. Is this bag yours? Sarah: No. It's not mine. It might be his. Anna: Thank you. Hello. Is this bag yours? Phil: Yes, that's mine. These are all my travel things. Thank you, thank you! Anna: Are you okay? You seem ... nervous. Phil: Well, this is my first visit to Washington, D.C. I'm from a small town in the country. I feel a little lost. Anna: I am from the country too! And I understand. When I first came here, I felt lost ... all the time. Phil: So, do you like living in the country or in the city? Anna: I like to live in the city. Anna: The city is exciting! It has more culture than the country. There are many museums and restaurants. Every night, there is theater and music. And, there are more jobs. That is why I'm here. Phil: Well, I agree. There is more culture in the city and there might be more jobs. But the country has more nature! It's peaceful and beautiful. There are more trees and mountains. The air is clean. You can go hiking and camping. The city is not beautiful. It's noisy and dirty. Anna: I disagree. I think all the different buildings are beautiful. And I like to watch all the different people. Phil: That's another thing that is different. People in the country are friendly. They always say "hello!" Here, no one says "hello." I think city people are rude. Anna: Well, I agree. Country people are friendly. But I don't think city people are rude. I think they're just busy. Phil: That's a good point. Anna: Look at me. I live in the city and I said "hello" to you. Phil: But you are from the country. Anna: I have an idea. Let's say "hello!" to people -- to many people! Anna: Well, if we say "hello," maybe they will say "hello" to other people ... Hello! Phil: ... and they will say "hello" to more people! That's a great idea! I'm glad you found my bag. Anna: Come on. Let's go say "hello" to people. Anna: We don't have to agree with people. They have their opinions. We have ours. And as we like to say, you can always agree to disagree! Until next time...! Hello! Use this video to earn the new words for this lesson. Then, learn how to give a reason when you say your opinion. Use this video to learn how to pronounce possessive pronouns. What is the best place to live? Tell us about where you live now or where you want to live. Be sure you give a reason for your opinion. Write about it in the Facebook Comments section below. Then practice sharing opinions. Click lesson activity to get the printable PDF version. The page opens to a new window.